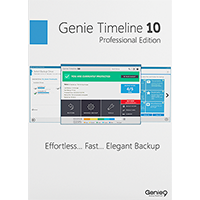 Genie Timeline Professional 10 is an exceptionally easy-to-use tool which takes the hassles out of backups. Once this is all set up, your life gets even easier. Genie Timeline Professional 10 runs in the background, looking for files to back up. It notices when you add new pictures from your camera, say, or edit some documents. And then, when your PC is idle, the program will copy the new files to your backup drive (it will even resume the backup later if you close your system down, or reboot). If you want to recover a particular file, or set of files, then the restore options make it very easy. Not only can you recover the last version of a file - the one you were working on last night and accidentally deleted, say - but you might also be able to recover the document as it was last week, maybe even last month. And that's because Genie Timeline Professional 10 backs up multiple versions of every file, so you can always go back in time to choose the particular copy you need. 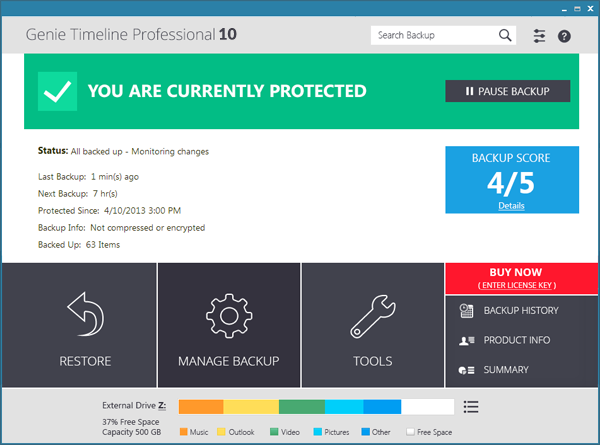 Genie Timeline Professional 10 ships with a 1-PC, non-expiring lifetime license.